I love comic books. but I have honestly stayed away from the core Disney characters in comic form. I really do want to be into this books, I just never have dipped the toe in. I want to know more about Disney Legends like Carl Barks, but his work is a Disney blind spot for me. So instead of going all in, I started with something free! 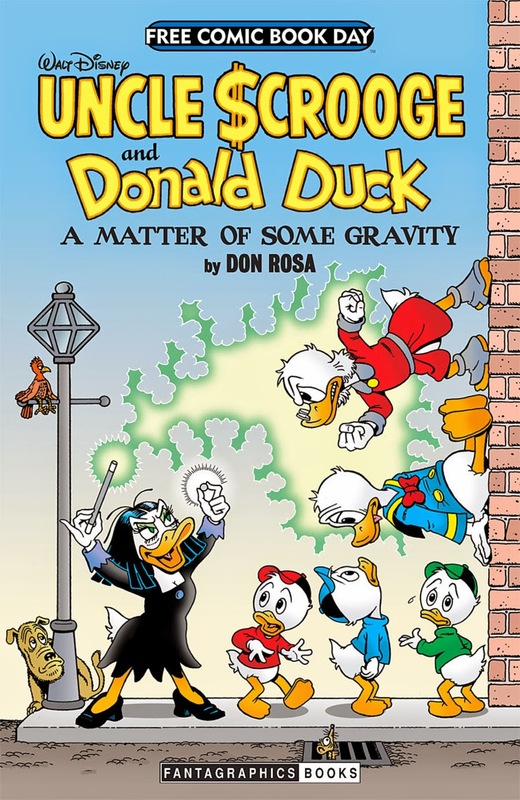 Walt Disney Uncle Scrooge and Donald Duck: A Matter of Some Gravity reprints Don Rosa 1996 Duck story now reprinted by Fantagraphics Books for Free Comic Book Day 2014. The main story features Uncle Scrooge and Donald attempting to reclaim Scrooge's Number One Dime from the sorceress Magica De Spell. But the chase is a challenge as De Spell has placed a hex on the duck duo which reorients their gravity. Rosa tells the story with the top half the page showing gravity from De Spell's and the reader's view. While the bottom half is drawn from the view of Donald and Scrooge. The second story, "Sign of the Triple Distelfink"from 1998 features Donald's cousin Gladstone, who is a very lucky duck. But his luck always changes on his birthday to bad! Gladstone attempts to escape his luck while Donald plans a prank on his fortunate cousin. The issue ends with an interview of Don Rosa discussing his history with the Ducks. The back cover is a Gladstone pinup or from Donald's view a "Obnoxious Cousin Dart Target." I will admit I did like this comic. But it is not my typical fare. The pages all had more panels than one finds in a superhero comic which really gives the comic more story for the page. In short, it is dense and you get your money's worth, in this case free! I also found the story punny. I could imagine Rosa attempting to work out gags like old Disney shorts story men. And the use of the gravity flip flop provides plenty of gag fodder. But most of all the gravity angle creates a really smart story that is delivered in an interesting way. It is easy to see how the story was nominated for an Eisner Award, that is Will not Michael! The Gladstone story is also amusing though it does bring out the worst in Donald. It is easy to see how both kids and adults would like these tales. I did like the interview with Rosa since I did not have experience with his writing and it helped me realize that he was a dedicated duck man. Free Comic Book Day you have helped me come one step closer to eliminating a Disney blind spot. You have turned my world sideways, or maybe Magica De Spell did. I really enjoyed Walt Disney Uncle Scrooge and Donald Duck: A Matter of Some Gravity and hope that there is another Fab Five inspired comic next year.